As the En+ Group started trading at London Stock Exchange on November 3 and promised to disclose its prospectus “shortly”, we publish excerpts from an article in Forbes by Kenneth Raposa written a day before the IPO. The RwB still hopes to learn how the En+ risks associated with Lake Baikal World Heritage site are reflected in its prospectus and management plans. Russian businessman Oleg Deripaska is finally getting his wish: his En+ Group will list on the London Stock Exchange. Even in a hyper-liquid market, the fact that this stock is unlikely to be oversubscribed speaks volumes. In a rare moment of camaraderie between greedy Wall Street-types and green activists, both agree that the company has corporate governance issues. En+Group is one part Rusal, Russia’s largest aluminum producer, and one part En+ Power, owners of some of Russia’s biggest hydroelectric dams. The company said in October that it would use the proceeds, in part, to pay for debts of the En+Group. Rusal is listed on the Hong Kong Exchange and has a 5.5% dividend yield. With En+, investors are getting more cash for more dividend flow. VanEck Global, owners of the biggest Russian exchange-traded funds, also said that they would not participate in the IPO for the simple reason that neither Rusal nor En+ Group are part of the index their funds track. Earlier last month, international environmental group Rivers Without Boundaries sent a letter to the LSE addressed to its chairman, Donald Brydon; the CEO of the U.K. Financial Conduct Authority, Andrew Bailey; and to En+ Group’s chairman, a British Lord brought in for good measure, Conservative Party politician Gregory Barker, in which they warned investors about what they said was corporate disclosure shortfalls. Activists have been going after En+Group’s hydroelectric dams for years. Some draw water from Lake Baikal rivers, a UNESCO World Heritage Site. 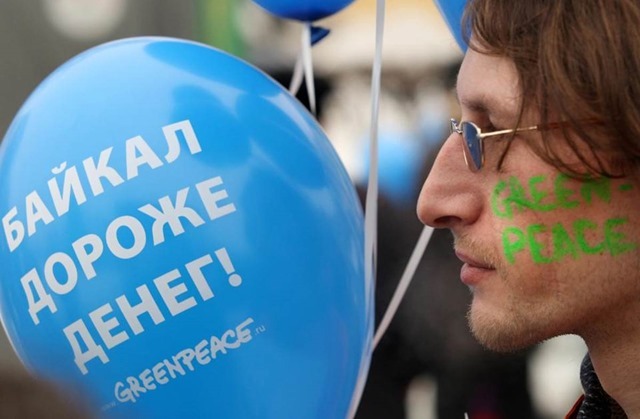 The balloon reads: ‘Baikal is worth more than money!’ Rivers Without Boundaries sent a letter to the London Stock Exchange warning investors about corporate governance at En+ Group, highlighting the environmental risks affiliated with Russia’s latest IPO. The market definitely agrees about corporate governance and name-brand risk associated with Deripaska. En+ Group expects to raise a total of $1.5 billion through the sale of new and existing shares in both London and Moscow. Reuters reported that the order book was fully covered for all the shares being sold, but not including a so-called green-shoe option where more stock can be sold in the case of over-subscription. En+Group likes to bill itself as a clean producer of aluminum because most of its energy is derived from its own hydroelectric dams. Activists like Simonov say that some of those rivers are important to Russia’s Lake Baikal, a UNESCO World Heritage Site in Siberia. En+ Group lambasted the letter sent to the LSE by Rivers Without Boundaries, calling their claims of poor environmental stewardship of the lake "false". En+ Group "has always complied with all applicable regulations and standards for water usage in its power plants," the company said in a statement. Despite Simonov’s environmental concerns, in a hot market that is still generally cool on this deal, it will be a surprise if Deripaska gets more than the money he is hoping for when En+Group launches on the LSE. But he will surely get the total book order filled.